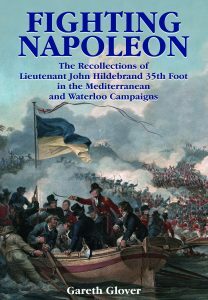 Over the last decade or so, I have had the privilege of publishing a large number of previously unknown memoirs of soldiers who fought in the Napoleonic wars, some of which are very extensive, whilst some are incredibly short indeed. A few are written in a very exciting and enthralling style but there are some that are frankly difficult even for a ‘Napoleonic nerd’ like myself to enjoy. But, I can honestly say, that every one of them has imparted at least one snippet of new information that has challenged my previous understanding, or was previously completely unknown to me. Although we may think we now have a very good understanding and knowledge of this period in history, it simply is not true. Unfortunately many of these memoirs skirt over the common place, the norm, the every day, because they were generally written contemporaneously and often only for a private family audience, who had no need or desire, to be told about what was an everyday life experience for themselves. That is precisely our problem regarding these letters and journals from two hundred years ago, they often miss out the minor detail, which actually to both military and social historians is a veritable gold mine, in enabling us to understand better their everyday lives. It is this very basic detail which we quite often lack and for which we strive. It is of course important to me as a military historian to understand the grand strategies, the movements of troops on campaign and on the battlefield and the weapons and uniforms they used. But just as significant and as important, if not more so, is the quest to understand their basic lives as humans thrown into, that unnatural state, war, and how they coped with it. In the last decade, much of my work on this original source material has unsurprisingly been concentrated on the two best known and well studied theatres of operations of the original ‘Great War’, as Victorians referred to the twenty-three years of World War against France and Napoleon. These of course are the Peninsular War (Spain, Portugal & Southern France 1808-14) and the Waterloo campaign of 1815. And particularly over the last five years my search has concentrated very much on the Waterloo campaign, hardly surprising given the prominence of its 200th Anniversary in 2015 and the associated hype. But paradoxically, this anniversary and the subsequent ephemeral, perhaps superficial and fleeting world interest; has actually spawned a great drive to seek for a better understanding of every aspect of the campaign. I do not think that I over exaggerate the situation, by stating that the history of the battle and those that fought it has progressed farther in the last ten years than it had in the previous one hundred and fifty. And although the quest for new material on these campaigns is certainly not at an end, it is perhaps a welcome relief to both this author and the reader too, to now expand their horizons beyond those Belgian fields. Within the unbelievably fascinating and complicated period encompassed within the all embracing title ‘The Napoleonic Wars’ are still many other theatres of operations where our knowledge and understanding is often very poor and incomplete. I have therefore chosen to expand my work initially into the realms of the Mediterranean theatre. Many may be aware of some of the major events that occurred in this area of operations, which included the Siege of Toulon; Napoleon’s Invasion of Egypt, Nelson’s great victory at the Nile; the Battle of Maida and perhaps may also have a fleeting knowledge of the operations on the East Coast of Spain. But besides these individual events, the Mediterranean is presumed to be a mere backwater, insignificant in comparison with the main event on continental Europe. But this is to belittle a major theatre of campaign which was active throughout the entire expanse of the war and bore a marked bearing on the overall war effort in many profound ways. Indeed in a more modern equivalent, it is like summing up the entire Allied operations in North Africa and Italy from 1940-44 as ‘El Alamein, Tobruk and Monte Casino’. In fact both of these campaigns although one hundred and thirty years apart have suffered from the same problem, being completely overshadowed by the fighting in Western and Central Europe. There is simply a lack of knowledge of the constantly fluctuating fortunes of the protagonists and a basic lack of understanding of the greater strategic threat to either protagonist of losing control of the Mediterranean. It is high time that this was remedied. As a part of this focus, I have sought new memoirs from soldiers and sailors who fought in this theatre, being one where the expansive coastlines and numerous strategically placed islands led to a much greater level of cooperation between the services, with joint operations actually becoming very much the norm. This memoir by Lieutenant John Hildebrand, whose family had hailed from Saxony in Germany only two generations before, is one such, and is actually a real gem. Not only is it a rarity because of the theatre it describes, but it is also a first for this famous regiment. The 35th Foot and subsequent ‘Royal Sussex Regiment’ are rightly famous for their exploits; the regiment was involved in the massacre that spawned the famous book ‘Last of the Mohicans’; they were at the capture of Quebec; the Battle of Bunker Hill; Maida; the unsuccessful expedition to save Gordon of Khartoum; the first Battle of Ypres where it became informally known by the Germans as ‘The Iron Regiment’; Dunkirk; El Alamein; Monte Cassino and Arnhem, to name but a few. But until now, no memoir from anyone serving in the two battalions of this distinguished regiment during the Napoleonic Wars has actually been published and it is high time that this situation was rectified. But beyond its rarity value, the real reason why the memoir is now being published is that it is genuinely written in such a pacey and exciting style, whilst it also pulls no punches and gives a real warts and all view of the life of a subaltern officer at this time. Indeed, his memoir reads more like those we associate with an independently minded young Royal Navy officer of this period, who often seem to have acted first and thought about the consequences later; than the more usually restrained and controlled responses of a young army officer, who was heavily constrained in their actions by the presence of their senior officers and a more rigid adherence to the military code. It would seem that these young army officers serving in the Adriatic, were given more freedom and often working without close supervision, caught the same bug as the ‘gung-ho’ naval officers on the station, who were always on the lookout for an adventure, whether at sea or on land. Small ship actions; cutting out operations and small scale landings were almost everyday occurrences and this spirit of adventure was clearly adopted by many of the young army officers on this station, who had been thrust into positions of some importance and influence at a very young age. So I invite you to join John Hildebrand in his various far from mundane and often humorous adventures in Malta; Sicily; Lagosta; Ragusa (now Dubrovnik); Italy and Corfu. But even then however, John was not finished, he returned home in 1814, thinking that his life of active service was probably over forever. Instead, within six months John found himself in Belgium, as part of Wellington’s Army during the Waterloo campaign and was subsequently involved in the march on Paris and the storming of the fortresses of Cambrai and Peronne. But by now he really had seen enough of war and as with many ex army officers from time in memoriam, he followed the tradition of becoming a vicar, in which capacity he saw out the remainder of his very long and happy life. Written at the end of his life, his memory clearly maintained its sharpness, as the author has found very few serious mistakes in his recording of incidents which had occurred some sixty years before, but clearly came to his recall as if only the day before to him, so vividly does he paint the scenes. Where perhaps understandably, a few dates or the sequence of events he describes seem to differ slightly from the known records, I have highlighted and discussed them, but in many cases John’s accounts actually seems the more plausible. Some historians have previously cast doubts over the authenticity of these accounts because of these few discrepancies, but apart from a few insignificant errors in correctly dating events the author has found very little to seriously question regarding their validity. In fact I am very confident that it will soon become a favourite of many who care to read it. Indeed it is such a good read I really cannot fully understand why it has lain virtually ignored for so long. The author is aware of Major John Slessor’s letters being published in Alethea Hayter’s The Backbone, but these only amount to snippets of his letters, which is a shame, as they are very instructive.